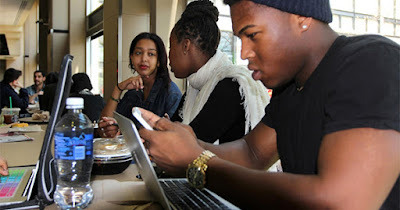 A shocking article recently appeared in the Harvard Education Press, a publication of the Harvard Graduate School of Education, that stated up to 40 percent of low-income students who are accepted at college end up not going at all. The article was written by Benjamin L. Castleman and Lindsay C. Page and sheds light on why many low-income students don't actually end up attending college. #1 - Financial - this is a big one. The financial reasons are many. They range from being accepted at a college but finding out they can't afford it, being hit with campus-related fees they can't pay, being forced to live off-campus due to overcrowding and finding out they can't afford it, and inability to take on student loans in order for them to attend college. #2 - Complicated paperwork - many low-income students are the first in their family to attend college, so they are unfamiliar with all the paperwork needed to complete. The Free Application for Federal Student Aid (FAFSA) form, used to apply for financial aid, is especially difficult. They often don't understand the difference between a grant (free money) and a student loan, which must be repaid. #3 - Feel they don't fit in - many low-income students feel they don't fit in with other middle- and upper-income students. This can cause enough anxiety to prevent them from attending at all. #4 - Lack of work-study opportunities - most low-income students depend on the work-study program to earn money for college as they attend. Yet many end up not getting placed. They either have to find an off-campus job on their own or not attend college at all.